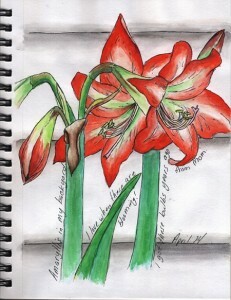 I’m also showing my sketchbook page for this morning; a couple of red amaryllis from my backyard. I have a whole row of these bright beauties. It’s been a busy week and I have a few other things that got done, if you’d like to go to the main page you can scroll down and see what else I’ve been up to this week. Welcome to the party! 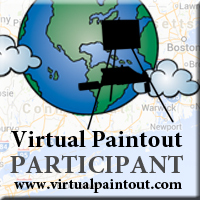 This entry was posted in Arts & Crafts and tagged challenges, faces, portrait, sketches on April 15, 2011 by admin. Melisa they are both stunning! The IA painting is just amazing and the color in your Amaryllis is to die for! Can I ask what type of watercolors you use? I’m searching for some good ones and don’t want to just rely on ratings on the web sites I’ve been looking at. and your flowers are wonderful to see as well. These are both gorgeous. I love the script around the flowers and the mother and child is simply stunning – you’ve really captured the feeling of love between the two. This is just beautiful! Love the babys face. Beautiful work! I LOVE the mother and child painting. Beautiful and sensitive emotion in your work. Both are wonderful, especially the mother/child. Wonderful job! You really captured that moment we mothers have shared wth our new babies. Very tender and private. Love the flower journal page too. Happy PPF! I love the mother and child. You’ve captured such a wonderful moment. The amaryllis is gorgeous! Your work is breathtaking. 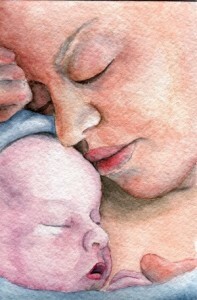 The mother and child painting is so full of tender emotion. Gorgeous! And your journal page! Beautiful flowers! I love the writing around the flowers as well. I love ALL your work! These two pieces are exceptional. I perused your blog and really like your sketchbook. We don’t have anything blooming here yet…winter is still hanging on. Happy PPF! Love the softness of the mother and baby. We’ve all known those moments. Great job. Happy PPF! I left a comment a few ago but it didn’t take. Had forgotten to input the required info. Just wanted to say that your painting of mom and child is fabulous. Very soft with a lot of emotion. Love your Amaryllis too. Those flowers are beautiful. Happy PPF! Beautiful! I love the cuddling mother and baby. So sweet. The Amaryllis are so pretty. I like how your wrote along their stems. I like to do that too. Your “mother” piece is so lovely and tender- you really caught the way it FEELS to be a mother- gorgeous work! And I love your sketchbook entry too- LOVE amaryllis- and the way you wrote around it is nicely done too! you’re very talented, beautiful pieces, thanks for sharing. That’s such a heart moving, touching painting. Wonderful. And the red amaryllis are vibrantly beautiful. These look wonderful! What a tender moment between mother and child! And your flowers are lovely! Gorgeous flower. The mother and child are beautiful and so full of emotion, you can feel the peace. After seeing your altered book page for Sunday Sketches I’ve started seeing them everywhere… I had never heard of them before! Who knew?!? (Apparently everyone but me! ha!) Well, long story short – I think yours are fabulous! The mother and child postcard is adorable…and the flowers just complete the picture. It shouts “new life!” as does the baby in the pc. Beautiful work!! Such lovely paintings. The one of mother(?) and child is so darling. Thanks for your kind words on my sea shell paintings. I do appreciate it. How sweet and the flowers are beautiful. The mother and child really stirs up deep maternal feelings for me. Both are beautifully done. Your art is stunning! Always amazes me to see watercolor done so beautifully. Amaryllis IN your GARDEN? WOW! I think of those as an indoor Xmas plant. Beautiful! Melisa: Beautiful Work! I so have to do a sketchbook – your sketchbook piece is frame worthy even! Very talented! So touching and tender, Love it!!!! and your flowers are so pretty, Well done on both pieces! Amazing talent, both pieces are beautiful and with so much depth and feel. Beautifully done. This is great so glad you played along with us at IA!! Hi! I didn’t play on PPF this week. So glad you did though because I love these. Especially the Mother and child for IA. It is beautiful! What an incredibly sweet painting, full of a mama’s compassion and nurturing….makes me feel like snuggling my cozy little cuties. You have captured a precious moment that we wish could last an eternity. Beautiful!! The flowers are gorgeous! The color came out perfect, and I like the layout. Very nice! Wow! Absolutely stunning..both pieces are beautiful..the mother and child is incredible…shine one..powerful work!